Today will be a simple post of this week’s activities. There are a couple stories I would like to tell, but I have not taken the time to think them through and write them out. 1) Language and culture training – learning the basic introductions of the Lugandan language, practicing the language and experiencing places in Jinja and our community. 2) House work – planning mosquito screens, sealing cracks and cleaning around the 18 windows of the house to cut the amount of critters coming in. This is a job! 3) Assisting Michelle and the kids in 3 days of ministry at a women’s conference. Our three children assisted a church from Arkansas in providing childcare for missionary mothers during the conference. This fit really well with our three kids. Michelle watched kids the first day, too, but joined the conference the second and third day. 4) Equip Uganda policies and procedures – I (Mark) am writing proposed policies for our NGO (non-government organization, i.e. Equip). 5) Immigration items – pulling together items I need for my work permit request. This afternoon we hosted 8 singles (four of those are interns from the States), three families (with a total of 12 kids) and our bunch of 9 for a house Bible study, which I led. Michelle and I both enjoyed having these folks in our home and fellowshipping with them. We rotate homes for the weekly Bible study. And yes, I did write our “9.” Our family has doubled from five members to nine – twelve on weekends, depending on how you count them. I will write more about this in the future and introduce these folks to you then. This week looks very similar to last week, with immigration and mosquito screens moving to a higher priority of things to do. The picture is a photo of Matooke (pronounced mah toe kee, which are cooking bananas). The consistency when cooked is like thick mashed potatoes, but turn out yellow when cooked. Matooke is served with peanut (ground nut) sauce. We also had rice, and green beans, but at the last minute Ruth changed the green beans out for a cabbage and pea mixture that tastes like something cooked at a Japanese restaurant. Very delicious. This entire bunch was purchased for about 12,000 Ugandan Shillings or $4.60 US dollars. We ate less than one fourth of them Saturday night. 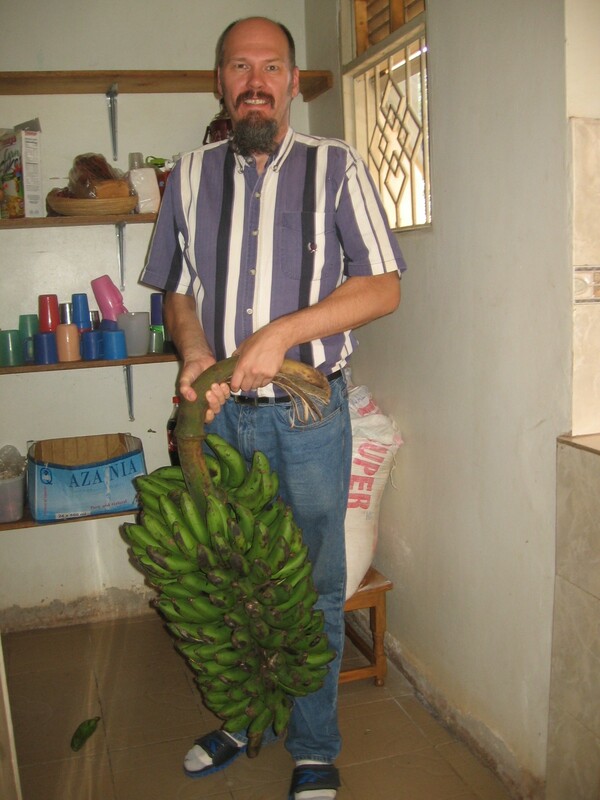 Josh did not like bananas before moving here, but now he eats bananas, and he “loves” matooke.